All About Art: Pastel Drawings – Are they Art? Pastel Drawings – Are they Art? Pastel Drawings are they real art or just a tool that artists use to advance their skills? For most drawing with pastels, charcoal or pencil is associated with sketches and rarely with real artwork. But the next time you take a look at a pastel drawing consider this famous drawings are sold regularly for thousands if not millions of dollars. So why are pastels are not so widely known - or in other words - popular? A lot of artists start with drawings or sketches because it is an easier way to learn to draw and very forgiving in a lot of as well. For example you can simply erase wrong line in pencil drawing. The oils usually come next as more advanced level in Art. Thus in memories of a lot of Artists drawings associated with the beginning of their carrier, an entry level if you will, so most do not come back to it after they become established artists. However, the masters that did, created some exceptional artworks that will be highlights of the Art's history forever. Another aspect is that pastels and charcoal usually are really good for figure drawings since they are the best media to draw skin and so most think that this is the only thing these media are really good for. However, especially with a lot of color pastels available on the market now, there is no limit to what you can draw with pastels. One other thing that works against drawing is that they are done on paper; not the most durable material to begin with. This is probably the reason why a lot more old oil paintings are available now than drawings. What works against pastels the most is they are messy. It is very easy to leave a mark or a spot on the paper when drawing with pastels. Watercolor is also very messy, not as bad as pastels or charcoal, but interestingly enough they are also not such popular form of art and always considered second best to oils paintings. Because of all these reasons artists are hesitant to work with pastels, and they are creating somewhat negative public opinion about pastels. After all who are the best experts on Art - obviously artists themselves. However, with help of technology, better days are coming for drawings. Paper is now more durable than ever, drawing can be easily framed and protected under the glass and if laminated, then they can survive virtually forever. Since it is very inexpensive to laminate even a large drawing and laminations services are widely available everywhere it is only matter of time until drawings will catch up with paintings in popularity and price. Of course pastels and graphite drawings are Art!!!!!! How can they not be? 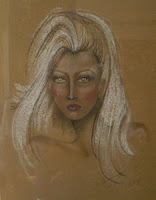 Pastel can be sketches or finished paintings (as oils can be a sketch or a finished painting). A pastel must not be immediatley called a drawing because it is not done with a brush- most are considered paintings unless the sticks are uses like a pencil and the work relies on line, rather than shapes, masses and colour as in painting.When you cover the surface with pigment- it's a painting.Pastels and drawings are becoming a lot more popular- their image is definitely on 'the up'. I find your comment that artists are reluctant to use pastels is totally wrong- do some research on the large number of pastellists today - myself included!! !